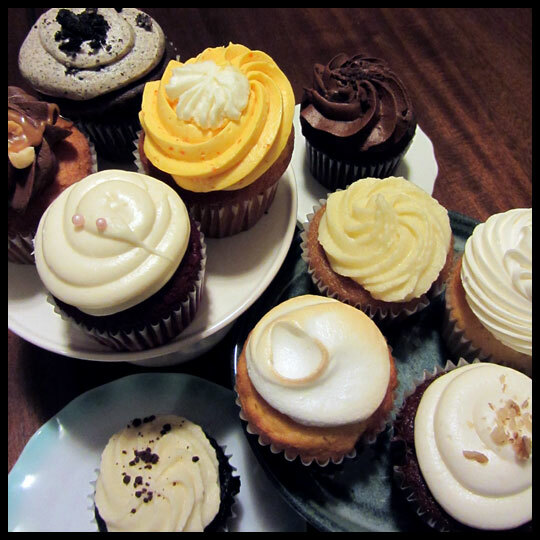 When you love your neighborhood, and love your neighborhood bakery, it’s such a disappointment when their cupcakes are nothing to rave about. Ever since I moved to the Hamilton neighborhood of Baltimore, Hamilton Bakery has been my go-to for anything BUT cupcakes. Their croissants are buttery, their scones are flavorful, and their muffins are the perfect pairing with a cup of coffee. Even their cake truffles are wonderful! I guess they realized that their cupcakes just weren’t up to par with all their other baked goods because on Friday, February 1st, they debuted their brand new line of cupcakes and gave out free ones to the first 500 customers from 4pm to 9pm. I was already planning to stop in for my free cupcake when Hamilton Bakery contacted us. They wanted to give us a chance to try a variety of flavors, confident in their new recipes. They were not at all stingy with the cupcakes they put aside for us. With 10 new and revitalized flavors, I was excited to get started. 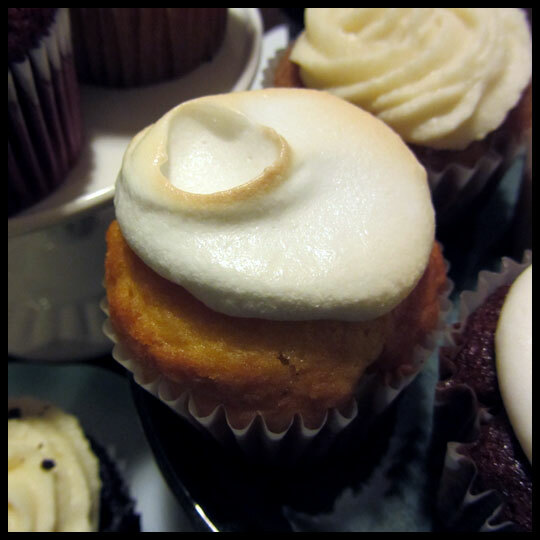 I was most excited to try what appeared to be a Lemon Meringue cupcake, so began my tasting with that. Unfortunately this cupcake was a bit of a let down. The cake was moist and the meringue “frosting” had a nice toasted crunch, but I was really hoping for a lemon curd filling. The cake also had a bit of an artificial taste, reminding me of Lemon Drop candies. After trying all the cupcakes, there were only a couple more disappointments, like the Peanut Butter Chocolate (not enough peanut butter flavor) and two cupcakes which appeared to be gluten free or vegan (dry crumbly cake and frosting that had separated), so the majority were still vastly improved upon. Since I tasted so many, I think it’s best just to focus on a few of the highlights which were the Vanilla, Creamsicle, and Carrot Cake. If tasked with naming Hamilton Bakery’s Vanilla cupcake I would call it “Birthday Cake,” because that is exactly what it reminded me of. 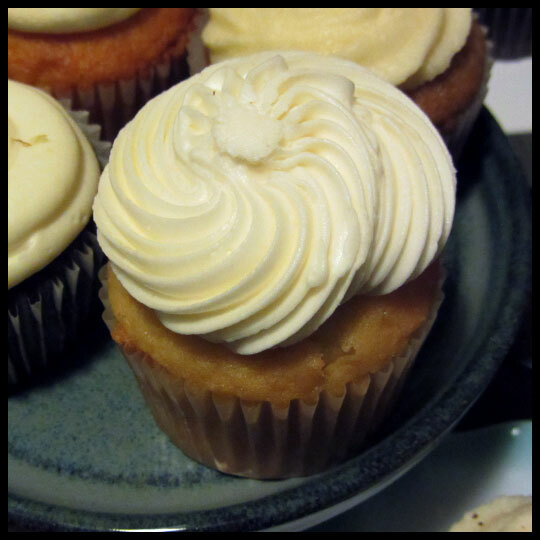 This cupcake had moist buttery vanilla cake with frosting that was sweet without tasting like confectioners sugar. There was a little bit of a crunch to the outside of the frosting, like it had dried out just a tad, but that just gave it even more of a birthday cake like quality. The next cupcake that I really enjoyed was somewhat of a mystery cupcake until I bit into it. 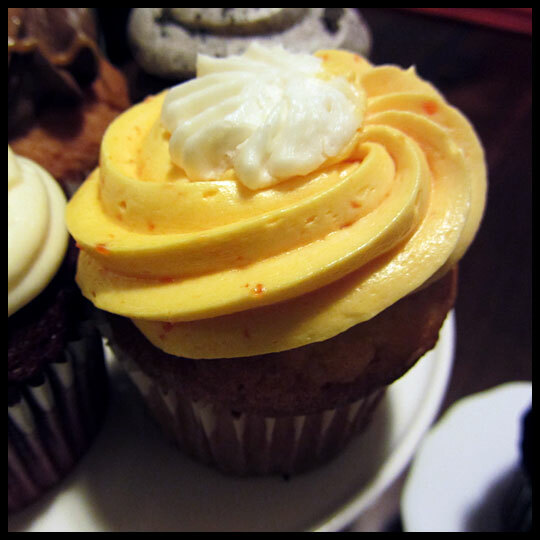 The orange flavor was so present that there was no question that this was a Creamsicle cupcake. The cake was a little over-baked on top, but luckily the inside hadn’t dried out. The orange-cream frosting was the best part though, and really made this cupcake standout from the rest. Carrot Cake is a classic that can be done really well, or not. Hamilton Bakery has their recipe for this mastered! The cake was super moist and chock-full of nuts and wonderful spices. The cream cheese frosting was sweet, without taking away from the flavor and really worked well with the cake. This is a cupcake I would go back for again and again. 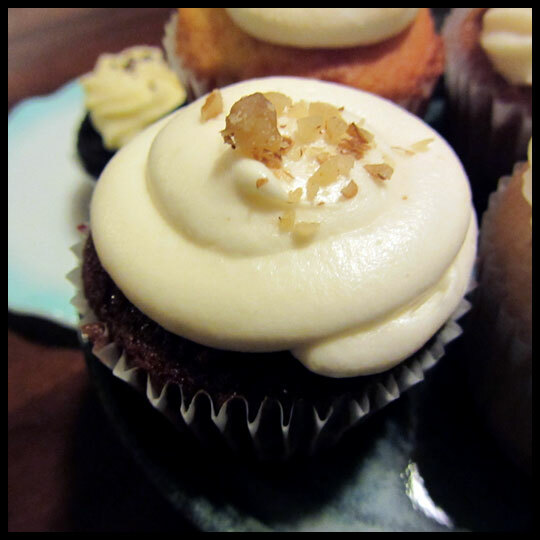 Having tried their carrot cake cupcakes in the past though, I believe that this recipe is something they’ve been doing right for a while now, and I really hope they don’t change it! Overall, I think Hamilton Bakery has definitely improved their recipes, but I do think they still have a little work to do on some of their flavors. I look forward to tracking their progress and now won’t be scared to buy a cupcake when I stop in for a breakfast pastry and some coffee. Looks like our little neighborhood bakery just might be able to compete with the big dogs in the cupcake market after all! 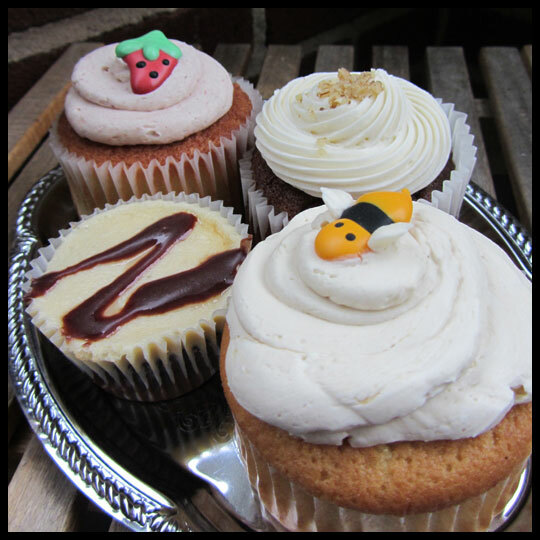 This entry was posted in Baltimore, Cupcakes, Maryland and tagged baltimore, carrot cake, Cupcake, Hamilton Bakery, lemon meringue, maryland, orange creamsicle, vanilla by Stacy. Bookmark the permalink.